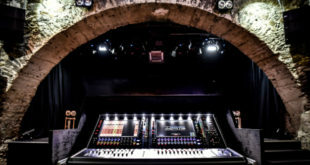 Audio mixing console specialist Allen & Heath are to unveil their new cost effective and scalable live digital mixing system, the GLD, at NAMM 2012 in Anaheim, California. The new GLD will be based upon the already successful digital iLive series. The GLD will have a standard 32 input system providing 28 XLR mic inputs with plug ‘n’ play I/O expanders which will allow easy extension up to 48 inputs (44 XLR mic inputs). The core of the new series is the GLD-80 mixer. 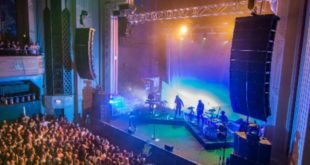 This provides the system with 48 processing channels, 8 stereo FX returns (fed by iLive’s FX emulations), 30 configurable buses, 20 mix processing channels and DSP power handling the processing. The GLD-80 is laid out with an analogue-style channel processing control section. This is complemented by a graphical 8.4 inch touch screen. Inputs and mixers can be easily assigned to fader strips using the drag and drop layout. This system is fully customisable. The 20 fader strips are arranged in 4 layers each with its own motorised fader. There is also a channel LCD display. This can be named and colour coded by the user. Furthermore, there is a rotary control which provides the user with direct access to gain, pan and aux/FX sends. The local I/O for the mixer itself includes 4 XLR mic/line inputs, 4 XLR line outs, 4 RCA inputs, 2 RCA outputs as well as digital outputs in SPDIF and AES3 formats. The flexibility of the GLD-80’s plug ‘n’ play system means it can connect to a number of I/O racks. 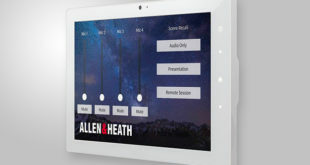 Users can thus put together 28, 36 or 44 mic input systems A primary AR2412 rack (24 XLR inputs, 12 XLR outs) and up to two AR84 expander racks (8 XLR inputs, 4 XLR outs each) can be connected over 120m CAT5 runs using A&H’s dSNAKE protocol. dSNAKE provides control to the remote preamp. All mic preamps are scene recallable. A connection for personal monitoring systems is also included with the AR2412. Standard iLive audio I/O option cards for Dante, MADI, EtherSound and Allen & Heath’s ACE protocols can be fitted. 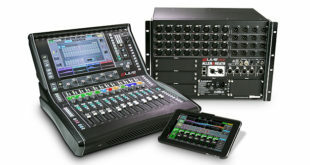 This allows for multi-channel record/playback, FOH/monitor splits and connection to Allen & Heath iLive systems. This can be easily configured using the extensive soft-patching available on the GLD. The GLD also has the ability to record and playback a stereo signal on a USB flash drive. The GLD will be released with the suggested retail prices of £5,652.91 (GLD-80 and GLD-AR2412) and £6,267.35 (GLD-80, GLD-AR2412 and GLD-AR84).